What's up, melon farmers? This week we discovered an app that promises to take all the rude words from your favourite ebooks, reviewed the best freakin' phone in the freakin' world, stuck Chrome right up our HDMI socket and had Jay-Z in the house along with some really famous funsters. 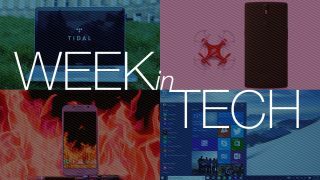 It's a completely filth-free Week in Tech! This week we saw one of the weirdest press conferences since Steve Ballmer left Microsoft. Jay-Z, Mrs Z and a host of celebs including Rihanna, Deadmaus and Madonna sang the praises of the CD-quality streaming service Tidal, whose sales pitch appears to be "hey! We aren't Spotify!" James Rivington reckons Tidal is pretty good with a few niggles, but Duncan Geere isn't impressed: it's "selling snake oil, sharing the profits with the richest artists alone, and the only way it's going to be able to get market share is by screwing over consumers." His suggestion? Go to gigs instead. The Samsung Galaxy S6 is great. But how great? Four and a half stars great, says our smartphone supremo Gareth Beavis. It's quite simply the best Android phone you can buy right now, and while the battery is "iffy" it's close to being perfect. "The camera is SUPERB, the build quality excellent and the speed under the finger second to none at times," he says. It might not be perfect, but the Galaxy S6 gets closer than anything else - and that's why it's now king of our newly updated list of the best phones in the world. But will it stay there for long? There's an LG G4 and a Huawei Ascend P8 on the horizon. Bring it on! Does Spartan have a halo? Windows 10 is due to ship this summer, and it's changed its plans for its new web browser. Project Spartan, as it's currently codenamed, will use the new EdgeHTML engine, but the Internet Explorer 11 browser will stick with the older Trident rendering engine. A rendering engine is the bit of a browser that displays content, and Edge does things better than Trident. The Spartan browser will be the default browser on all versions of Windows 10, but some of them will get IE11 too. There's no way that's going to confuse anybody. At first many people thought it was an April Fool, but no: OnePlus really is making a teeny-tiny drone. The excitingly named OnePlus DR-1 promises to be the world's smallest remote control drone, and while it looks like a lot of fun it isn't something you can connect to your OnePlus phone, or to any other phone. It'll cost around £16, takes 20 minutes to charge and should fly for about eight minutes before you lose sight of it completely and have to buy a new one. Globe-straddling chat application WhatsApp has got a whole lot more useful with the introduction of phone calls over 3G, 4G and Wi-Fi. Say goodbye to counting your minutes each month, and say hello to the sound of mobile phone networks weeping. As James Rivington explains: "while this is great news for us, it's surely bad news for the mobile networks and will likely be the first step in a cosmic shift in the way they structure our tariffs… a city-wide Wi-Fi network could make mobile networks obsolete overnight." That raises interesting questions about the future of mobile phone firms. "In a world where networks are doing all they can to charge us more rather than less, how will this all shake down? How will networks justify their prices if they're unable to keep us happy with 'unlimited this' and 'unlimited that'?" In a week that brought us the joyous news of a Daphne & Celeste comeback, Google appears to have embraced the message of their hit "Ooh, stick you": the eminently stickable Chromebit costs just $100 (about £70, AUS $130) and turns any HDMI display into a fully fledged Chrome OS PC. It'll go on sale this summer. There are some new Chromebooks en route too. We particularly like the Lenovo-inspired Asus Flip, a really cheap – $249 / £167 / AUS$327 – Chromebook that you can flip to turn it into a tablet. Some new manufacturers are getting into Chromebooks too, but they'll have to be really good to beat our favourite Chromebooks of 2015 so far. The Clean Reader app offers three levels of cleanliness – clean, cleaner and squeaky clean – and Kate Solomon reckons it's freaking crap. No, not really. But as Solomon points out, using algorithms to clean up content is daft: the results don't always make sense, and the words are often there for very good reasons in the first place. And of course, in some books the swear words aren't the most offensive things you'll read.